Conference Tables and Cafeteria Tables for Any Type of Meeting. Free Shipping! All the great business ideas, discussions, and strategies happen in the conference room. Conference room furniture for the office is vital for delivering a professional message in the business world. You want the mood to be symbolic in your furniture, and the tables should have the space to be comfortable at a professional meeting or conference. We proudly introduce our most popular conference tables in the Mayline Medina and Mayline Aberdeen lines. Their most popular are the 8’ and 10’ tables, but we carry up to 30’ conference tables! 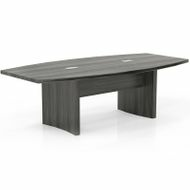 Search our wide selection of tables offered in a variety of finishes. From gray steel, brown sugar and driftwood, to the traditional mocha, cherry and mahogany finishes, you’re sure to find the right look to complete your modern or traditional décor.